Bitcoin is an amazing invention and it fulfils every aspect and every requirement to become an effective payment alternative. Alas, many people are still using it for investment only to amplify their profits. The reasons are obvious. Even after eight years in the market, many merchants and retailers haven’t completely opened up to it. And there are still very few platforms that are accepting bitcoins. 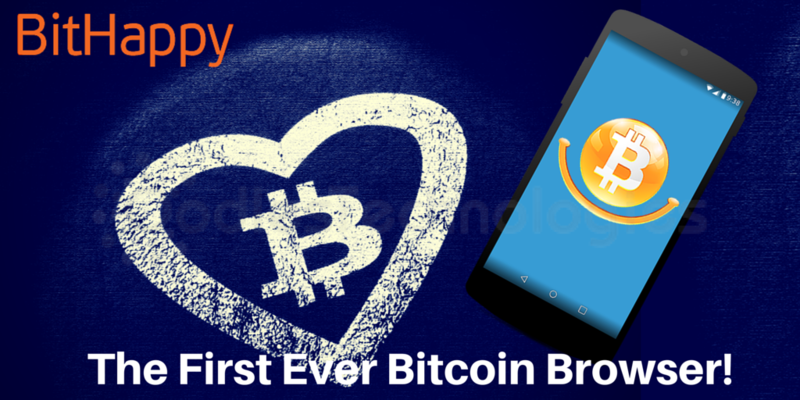 However, a new bitcoin start-up, BitHappy has launched a mobile app that can prove to be a game changer for all those who want to embrace bitcoin as a payment alternative. BitHappy is a web browser and bitcoin payment processor that brings various buyers and sellers under one roof, allowing them to exchange goods and services using bitcoins. The application is favorable to both buyers and sellers. The sellers can easily create advertisements for their products, specifying the price in local currency while the proportionate BTC amount will be visible to the buyers. The sellers can add multiple pictures of their products along with the description and website details. They can also add short videos directly from youtube to make the ads more attractive and enticing. The buyers can easily locate all the nearby sellers in their area and they can browse through various categories to find the product they are looking for in no time. The buyers can make payments within seconds, thanks to the Mycelium Wallet integration which will make the transactions possible on the go. With its simple and intuitive interface, anyone can use it with utmost ease. The buyers and sellers can also interact with each other through its real-time messaging functionality. One can use it for scanning barcodes in stores as well. Last but not the least, It also allows you to donate your bitcoins to various charitable organizations if you’re looking for some charity. BitHappy provides security to the transactions using Escrow service which ensures a safe delivery of products to their respective buyers. Whenever someone pays for a product on BitHappy, the amount isn’t instantly credited to the seller. It is first deposited to the Escrow. The Escrow releases the funds to the seller only after the safe delivery of product to its respective buyer. In this way, it forms a reliable and trustworthy platform for various purchases and averts any kind of fraud. The application was first launched in November 2015 and it has been recently updated to the newer version. Although it will still take some time to form a good user base, BitHappy can veritably revolutionize the world of e-commerce.